Please note we will be closed Sunday, April 21st in observance of the holiday. Unlock your home's equity at a great low rate! All of our credit cards now offer Apple Pay, Google Pay and Samsung Pay. Take a break - from your loan payment. Sign up for Skip-A-Payment today! We’re not your usual bank – in fact, we’re not a bank at all. We’re a not-for-profit, member-owned credit union, which means we can focus on your best interests instead of the best interests of shareholders. You work hard for your money. Let’s make sure it’s working hard for you. From estate and investment planning to Health Savings Accounts and retirement planning, we want to make sure you’re getting the most out of your finances. 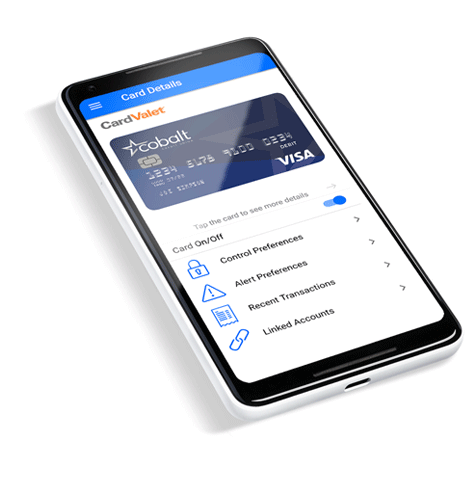 Get on-the-go debit card alerts with the CardValet mobile app. Teller was friendly and knowledgeable! She is a great representation of the credit union. Personal visits are always handled very well. Love your drive-thru services, very quick and efficient! I feel welcome at Cobalt.